Admittedly, our Wooden Gazebos and Arbours are not least expensive ones available in the UK. 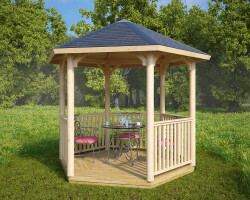 However, when you are looking for premium quality for a very affordable price, then look no further than our wooden gazebos and pergolas. 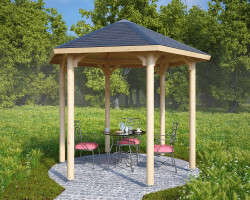 All our gazebos come with extra strong 120 mm posts. Most of them have solid wood flooring. All of them come with five-year factory guarantee. 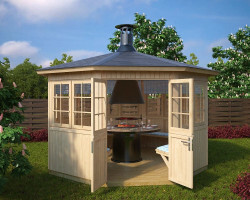 In addition to our elegant wooden Gazebos and Arbours, we would also like to introduce our Scandinavian style BBQ Huts and traditional Finnish Grillkotas. 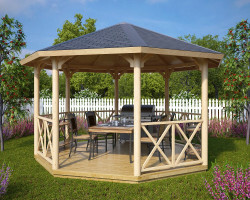 They are all made for entertaining your friends in your garden and for enjoying time with your family. What makes buying a wooden gazebo or pergola so special? 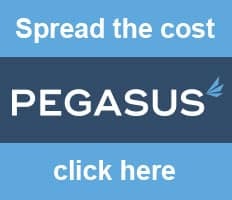 We deliver to you a natural, untreated product. Installation is easy enough for a DIYer. After installation, you can let your creative juices flow. 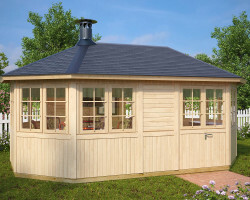 Choose the style of balustrades, colours, climbing plants, and flowers, roofing shingles and decoration. 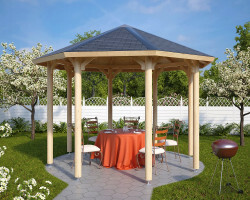 These choices will help make your new gazebo or pergola the crowning glory of your garden. It is a true piece of art. 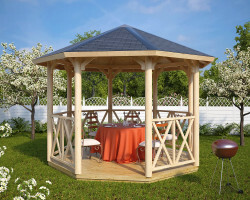 Our wooden gazebos start at 6 m² and are available in sizes up to 15 m² models. Grillkota is an old product originating in Scandinavia. Within the last ten years, they have gained in popularity across the UK and other parts of the world. Grilling in any weather is a strong argument for having a Grillkota. 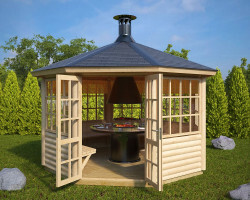 But, gathering with a good company around the fire, watching as your steak or fish prepared over the fire while enjoying snacks and drinks all make Grillkotas and BBQ Huts so special. 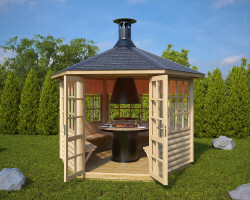 Besides Grillkotas, Hansa Garden has designed octagonal and hexagonal BBQ Huts and Grill Pavilions that have bigger windows and a more elegant look from outside. 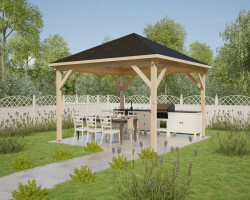 Smaller BBQ huts and Pavilions are made for ten people to gather around the fire and enjoy a grilled feast. 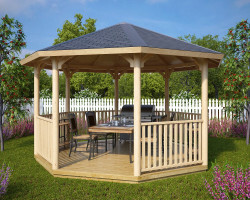 Larger ones can accommodate up to fifteen persons. 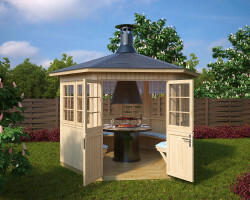 All Grill pavilions, BBQ Huts and Finnish Kotas are intended for all-year-round use. 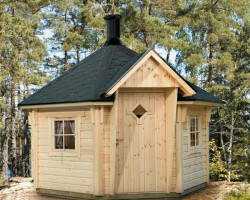 All our garden grill cabins and BBQ huts are equipped by same highest standards: Central Charcoal BBQ Grill, granite table fitted around the grill, adjustable smoke extraction hood, chimney and chimney cap set, and fixed wooden bench seating. 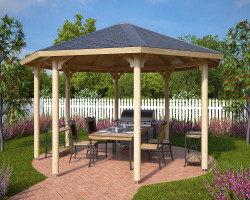 The granite grill table is not found in all BBQ Huts. It is very hard to find. Compared to the wooden tables around the grill, this one will look almost like new after five years, and even ten years. 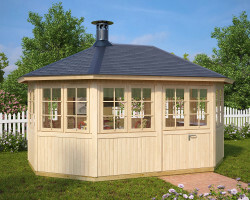 It is easy to clean, attractive, and very durable.